Mumbai: Nisha JamVwal and Phoenix Market City hosted a swish champagne high tea to celebrate women achievers at Bombay Coffee House. JamVwal's forum, the #BombayWomenAchievers group attended in full force, enjoying the hot scones, preserves, paper thin sandwiches, petite four cheeses and cheesecakes along with other delectables accompanied by a buzzing tea bar. Nisha JamVwal's forum is about mutual growth, discussions, discourses, support systems to each other in crisis, discussions suggestions brainstorming and philosophy. 'I believe in women for women' This is a movement to support, uplift, motivate and encourage each other, vanquishing the stereotypical envy and competitiveness women have been blamed for. Let us prove them all wrong! Team building, motivation, growth and also finding solutions to issues through forum meetings is my focus,” averred JamVwal looking stunning in a swish pink creation by designers Poonam Trivedi and Shraddha Vora. 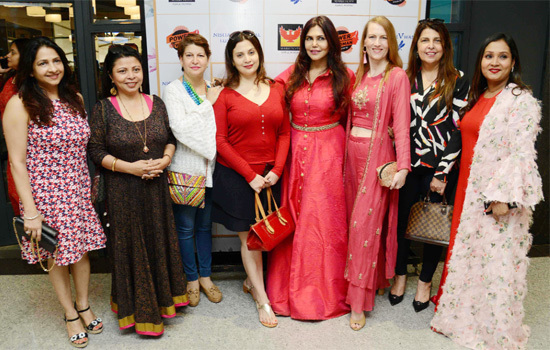 Women from myriad walks of life attended the do, including Nisha JamVwal, actors Suzanne Bernett, Shreya Narayan, jeweller Dhanika Popli, Ace dietician Suman Agarwal, social worker-entrepreneur Jyoti Vora, Poddar School Principal Avnita Bir, Ace gynaecologist Dr Rishma Dhillon Pai, judge Rajyalakshmi Rao, author Neelam Kumar, Reena Gupta, Madhu Satish Shah,Shilpa Tulaskar, Kiran Sippy, Roshni Damania, Delna Mistry, Krishaa Ghanasingh, educationist Sharvari Luth, show director Yasmin Morani, filmmaker Nandita Om Puri, singer Anushka Jag, lawyer Shobha Jagtiani, writer-director, animal and gender activist Anusha Srinivasan Iyer, writer artist Shashi Bansal among others. The surprise element infused by JamVwal was a live performance by American singer Anushka Jag who performed her new single 'Rebirth' to a standing ovation. Her single speaks of woman’s new beginnings and several rebirths.